When you are playing with interior styles of your house, you also try playing with colors. You may focus on two or three shades for your particular room. But what about the people who are in love with rainbow colours? 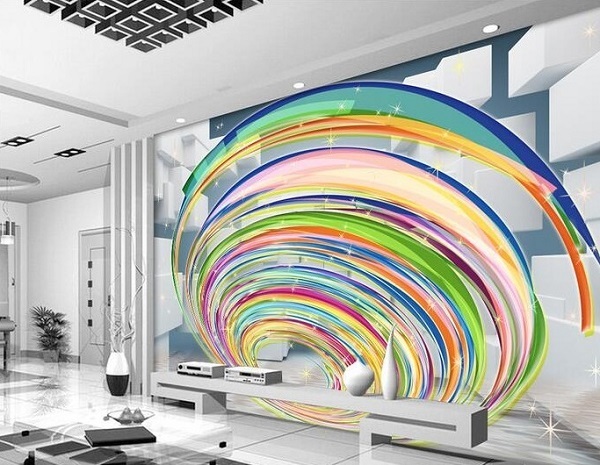 Now it is possible to add rainbow colours in your home decoration to make it more stylish and innovative. Here are some ways that introduce rainbow in home decor. 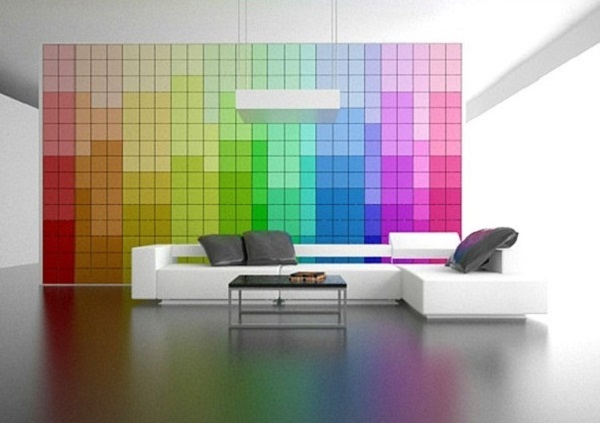 Select the colour of tiles that create a pattern that constantly evolve your style of rainbow. Also, you can choose the modern rainbow motif for your living room. Rest of the place can be painted in white or black or change it that suits the best and follow your taste. The best renovation of your home is to design your floor tiles. Colorful wooden flooring will be the best add on the floor of living room with rainbow colours on floor tiles. Rainbow style rug is easily available in the market. Without the use of paint or any other materials, here you have to simply buy the rainbow rug. For this room, add a window glass and simple flooring. Moreover, you can place different coloured couches. 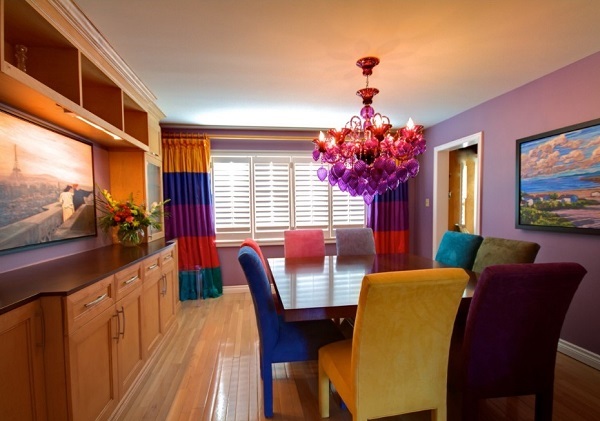 Moving from room to room, add one colour of your rainbow into a particular room. You can simply show this using accessory of particular colour of that room. Thus, makes a rainbow band in your home and put the background wall colour in white. 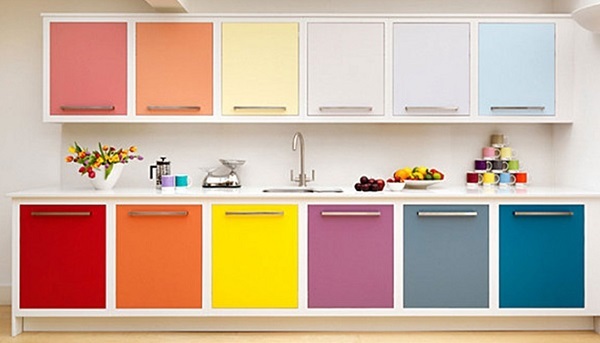 Make the use of rainbow colours in counters and storage cabinets of kitchens. 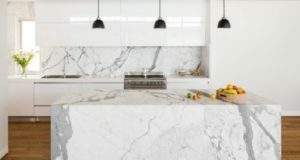 You can add various bright colours to make fabulous modern kitchen. The cabinets that are placed in your kitchen, place the cabinet doors in the band of rainbow colours. You can also paint the cabinets using paint brush. Rainbow kitchen with the kitchen chairs in an array of rainbow colours. Thus, it enhances your personality and great idea for the utilization of colours. 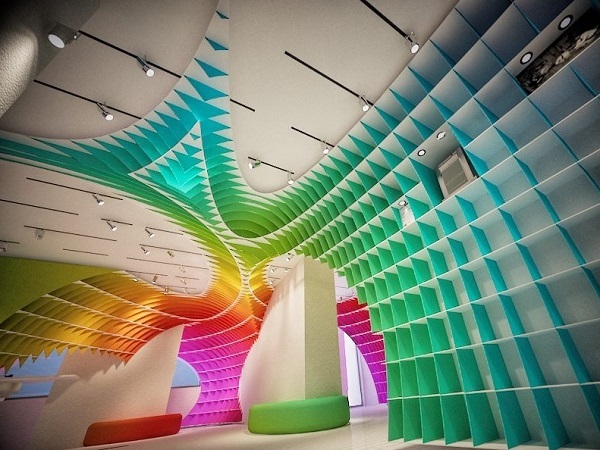 Paint the wall of your bedroom with the band of looping rainbow. Also, pick the canvas for your room in the rainbow colour; green, orange and red would the best suited colour for this. Choose the bed for your bedroom that has modern floral painting with rainbow colour. Take white colour as the base of the bed. 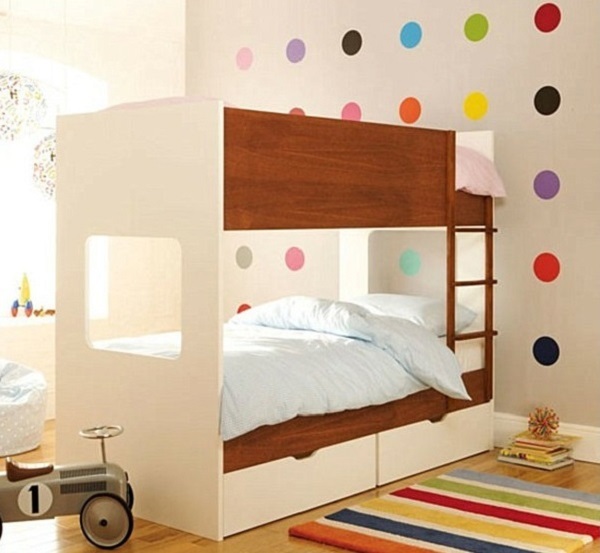 If you are planning to design the bedroom for your kids, the make the wall with rainbow polka dots that garb everybody’s attention. Thus, kids find themselves to be near to colours always. Add a touch of rainbow colours by buying art pieces, which works great for your kids’ room. Rather than buying some colourful papers of rainbow band, art work items suited well. The modern stripped cotton bedding set works the best for kids’ room. 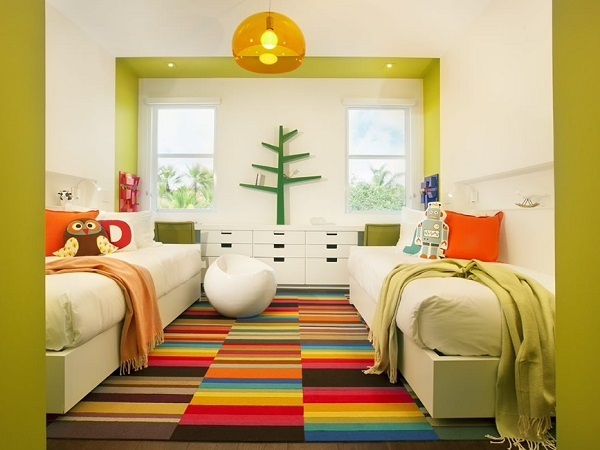 It’s not only give liveliness to your kids ‘room, thus makes a colourful and contemporary room. 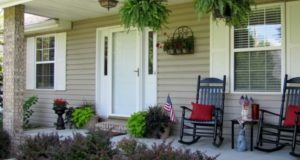 Bathrooms are generally smaller in size in comparison with any other room of your home. Thus, smaller space gives the real saturation of colour. Very Often, people are more like to add some creativity in the bathroom spaces. Rainbow bathroom is best in that case. 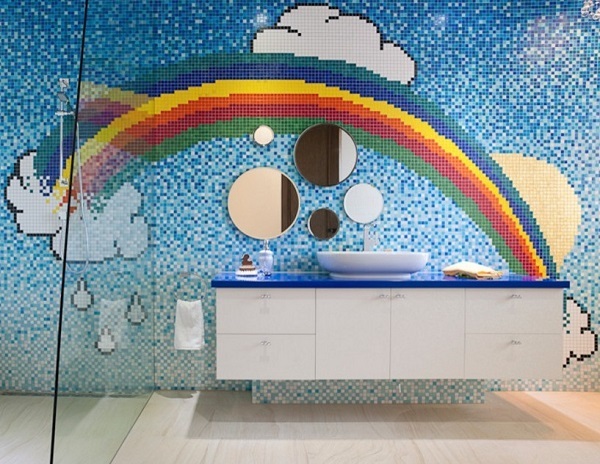 Buy the tiles of your bathroom which depicts the rainbow band. Each tile to be painted in seven colours makes it more unique and adds a wow factor in your bathroom. Divide the whole wall into seven layers and for each layer buy a particular colour starting from violet to red. Cover a single wall of your kids’ room with seven strips of showcase, where he or she can easily put some toys, photo frames or study materials. Colour each strip or layer with rainbow colour. Paint the walls in the bright colours combination or even with multiple colours. Stripped accent wall is perfect and you can also use wallpaper. Also, you can opt for colourful furniture for the area and make a series of colourful storage shelves. To enjoy the candle light dinner with dim lights, you simply have to place colourful tube lights in your kitchen. Switch on these lights during night to make your kitchen colourful in night also. To make one wall hanging for your room, buy a big round golden shiny ball; tie up with ceilings and paste different color paper strips on the threads. Cover the three sides of wall of wash basin that filled up with the effect of colour pixel. You can choose rainbow colored tiles that create the imaginative effect and also place white tiles in between to make it classy. Buy the cushions in seven colours of rainbow and place them on the sofa of your living room. You can buy as many cushions according to the size or requirement of sofa but buy only in rainbow colours to make your room style modern. 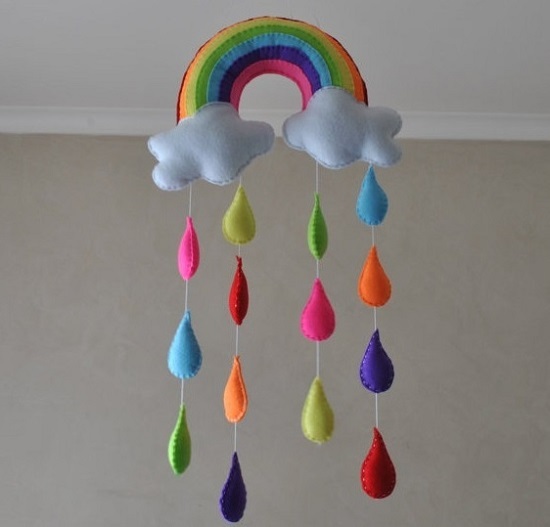 What are your views on decorating home with rainbow theme? 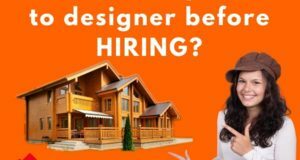 Share with us in comment section.